Xiaomi Redmi Note 4 smartphone was launched in August 2016. The phone comes with a 5.50-inch touchscreen display with a resolution of 1080 pixels by 1920 pixels at a PPI of 401 pixels per inch. 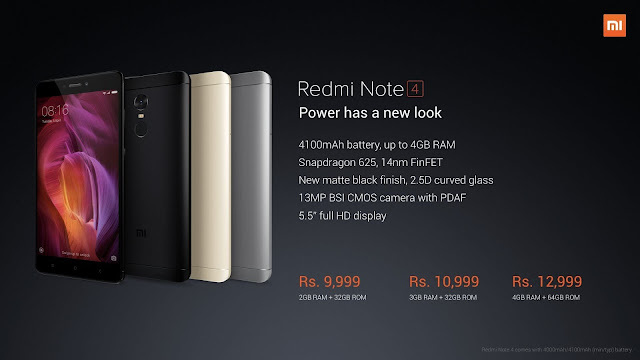 Xiaomi Redmi Note 4 price in India starts from Rs. 10,999. 2.5D thicker glass on top of the screen providing the mobile with better display quality and durability. The mobile is made with premium anodized aluminium. Bottom mounted speakers that fetches great sound. Whole Slimmer bezel with new matte black color option. Made of CMOS sensor with Backside illumination features a large pixel area that captures adequate lighting. Image signal processor enhnaces photos by fixing distortions and an usual 5 piece optic lens produces real colors. The newly added ultra focus 0.1s Phase detection autofocus for capturing moving objects much clearer without shakes. Asusual MI phones are known for its software optimizations in which real time beauty filters and even editing tools are present for getting fruitfull photos. A normal 5 MP snapper front that is present as a N additions as seen elsewhere. Snapdragon 625 midranged mobile processor that is 20% more power efficienct than its predecessor as per the company claims. Equipped with 4Gigs of RAM that delivers smoother daily usability performance. 4G LTE supported dual SIM,infrared remote sensors for tuning televisions. Upto 64 GB internal storage with 128 GB expandables. Fingerprint sensor ,no NFC support I guess. MIUI 8 upgradable to MIUI 9 later is one of the best software UI I have very seen so far. 4GB Ram & 64GB Storage. 5.5″ Full HD 2.5D Curved Display. micrometre Larger Pixels (Better Picture Quality Than Redmi Note 3). 4100 mAh Battery With UpTo 40% Extra Battery Life Than Redmi Note 3. Comes With Android 7.0 Nougat. Snapdragon 625 Octa Core Processor, Which is 20–25% Slower Than Snapdragon 650 Hexa Core Processor. Comes with Big Battery But Doesn’t Support Fast Charging. No feature is newly added to the phone,but considering the price of the mobile it's a worth buy compared to other branded devices.